RiSE V1.5, on a tree trunk. 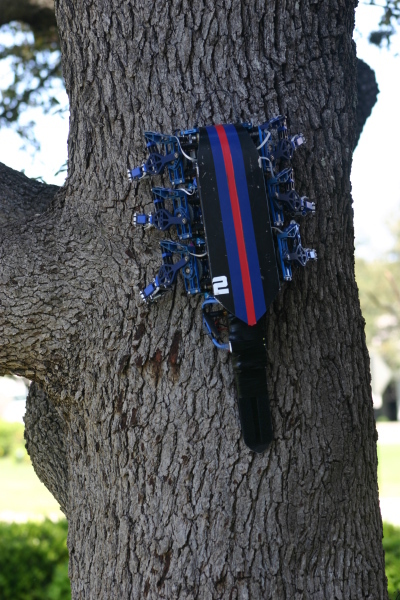 RiSE V1, part of the overall RiSE Project, was the initial DARPA Phase I prototype of the RiSE climbing machine. Similar to RiSE V2, it contained 6 legs, each actuated by two motors operating through a differential gear mechanism. RiSE V1 was designed by Boston Dynamics, with input from the RiSE Project consortium. This version of RiSE was primarily tested on simple surfaces such as a carpeted wall (for behavior development), as well as some outdoor surfaces such as trees and level ground locomotion. RiSE V2 added several design modifications and had the additional capability of climbing on outdoor building surfaces such as stucco and brick.